Our first Insider profile of the year features a young man who has made it his life’s mission to combine ministry and philanthropy to transform communities. Meet Lyord Watson, Jr., a preacher and philanthropist from Brewton, Alabama who was recently selected as a 2011-2012 Association of Black Foundation Executives (ABFE) Connecting Leaders Fellow. The year long fellowship is designed to sharpen the skills and strengthen the leadership capacity of foundation staff, donors, and trustees who are committed to assisting Black communities through philanthropy. The fellowship begins this month and will expose Fellows to key issues in Black communities and the role of philanthropy, and provide exposure to seasoned Foundation executives in the field. As a philanthropist, Lyord is a founding member and vice president of Education and Grants for the giving circle, Birmingham Change Fund. In 2009, he was recognized for his civic and philanthropic leadership by the Community Foundation of Greater Birmingham as a National Philanthropy Day VIP. He serves on the board of directors for the Community Investment Network, a national organization that encourages organizations and individuals to think and act more strategically with their giving to impel greater social change in their communities. Read on to learn what Lyord is looking forward to as an ABFE Fellow, his highlights from an event hosted by his giving circle about black philanthropy and the church, and how his wife Katrina gives back in their community. Education: Degree in business management and a Master of Divinity Degree from Beeson Divinity School, Samford University, Birmingham, AL. Current position: Associate Minister at Greater St. John Missionary Baptist Church and founder of Ekklesia, a ministry that helps people live out their faith in every aspect of their lives. Community Involvement: The Association of Black Foundation Executives (Member), Alabama Poverty Project (Faith Advisory Group), United Way (Visitation Allocation Team Member), Community Investment Network (Member), Cornerstone Schools of Alabama (Junior Board Member), Ronald McDonald House (Young Leadership Board Member), Big Brothers Big Sisters of Greater Birmingham (Volunteer), Financial Discovery Forum (Member), and Alpha Phi Alpha Fraternity, Inc. (Member). Congratulations on being selected as a 2011-2012 ABFE Fellow. Why did you apply to the program? What are you most looking forward to? I first learned of the fellowship through the Community Investment Network (CIN). Chad Jones, the executive director for CIN and a past participant in the fellowship, suggested that I look into the program. I applied to the program because I wanted to learn more about the field of philanthropy. I also know people who participated in the fellowship, such Darryl Lester, founder of CIN and HindSight Consulting; Athan Lindsay, who also was instrumental in founding CIN and was ABFE’s 2006 Emerging Leader in Philanthropy award recipient; Marcus Littles, Senior Partner at Frontline Solutions and Chad Jones, whom I mentioned earlier. I am probably missing other people, but when I saw those names, I knew I wanted to apply. I’m also on the Board of Directors for the Community Investment Network. I believe that part of my responsibility to the members of the network is to continue to develop skills, talents and relationships that will help move the organization forward. How will this fellowship help you to advance your professional skills in philanthropy? 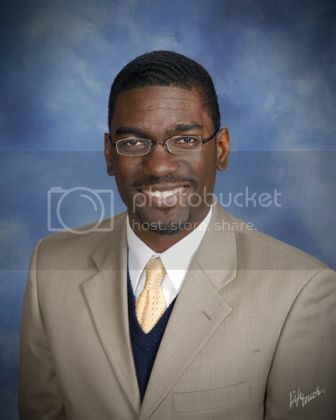 Professionally, I will gain greater capacity to affect change in my community. I believe that the fellowship is well designed. Everybody has strengths and weaknesses. The program allows you to share your strengths with the class and will help to develop other areas through the professional coaching component. I believe that by being a part of this fellowship, I will have a greater understanding about issues affecting the African American community nationally, but more importantly I will gain exposure to how others are using philanthropy to meet those issues. The exposure will also make me a better advocate and teacher of philanthropy. 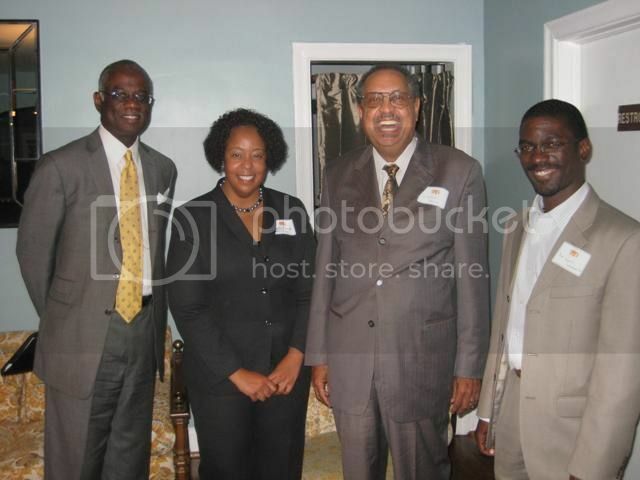 Lyord (far right) is joined with participants from the Philanthropy and the Black Church event hosted by the Birmingham Change Fund. Left to right are Reverend Thomas Wilder, Martha Emmett, and Dr. Wilson Fallin. You belong to a local giving circle, the Birmingham Change Fund (BCF) as a founding member. 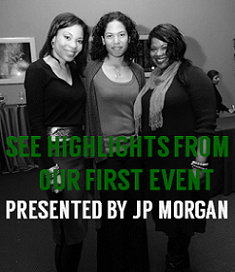 Your circle recently hosted the event, "Philanthropy and the Black Church." What were the key themes discussed? The role of the Black church in the past. Speaker Dr. Wilson Fallin explained that the church was the largest black institution during reconstruction. Churches learned how to come together and use their limited resources to aid the community. 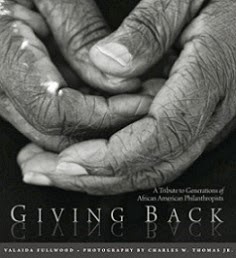 Benevolence was the term that was used for giving. Dr. Fallin spoke about Rev. Pettiford, who founded the Alabama Penney Bank. It was the first African American financial institution in Alabama and the second largest black bank in the nation. There was a representative for the bank at all of the African American churches. The church would take up tithes offerings and then they would take a collection to be deposited in the bank. In turn, the Alabama Penney Bank provided loan mortgages for African American churches, businesses and people. Another speaker, Martha Emmett, talked about how her family and church shaped her philanthropy. Before she knew what philanthropy was, she understood the importance in giving. She learned from her father, who every Friday night ate with his family and would invite people in need to eat with him. She observed that everybody gave to the church. It didn’t matter if they were a member or not. Emmett said, “People supported the church because they knew the church was there for them.” Now she continues to be very active in her community and it is because of the culture of giving that she grew up in. Visionary – have to talk about the future to move our communities forward. Through God’s words and ways we can be more than what we are. A voice – speak for people who cannot speak for themselves. There are people in our communities who cannot speak for themselves because they may not know the law, they may not have access, or they may have other reasons. The church needs to be a place to pull people through difficult times. Vetting – provide accurate information about issues and events that affect the African American community and explain how it is relevant. Historically the church is where people sought information. The church has to communicate truth. Vehicle – God has to have someone to move through. People have to take messages to the prison, nursing homes, doorsteps, etc… We (the church) have to exhibit and demonstrate God’s actions and be relevant. In May 2011, my wife [Katrina] started Birmingham Natural Beauties (BNB), a group for women to support, connect, and encourage one another on their natural hair journeys. It’s rooted in Psalm 139:14 “I praise you for I am fearfully and wonderfully made. Your works are wonderful, and that I know full well.” In accepting their God-given beauty, the women are able to embrace and accept the beauty of those around them. BNB has grown to more than 500 women and culminated 2011 with “Joy to the Curls,” a Christmas party featuring nationally acclaimed jazz musician Eric Essix. BNB’s signature event, “Tress Relief” is a gathering that takes place every other month. One month, it focused on exercise with a presentation about hula hooping for health. In another month, the women heard about how to care for hair and scalp issues from a local dermatologist. Other events have included a product swap. The group’s next event is Generations, on Sunday, February 5 which will focus on African-American hair and perceptions across generations and decades.